Jim Reeves sings Country Gospel Songs with so much sincerity, and that is what I like. 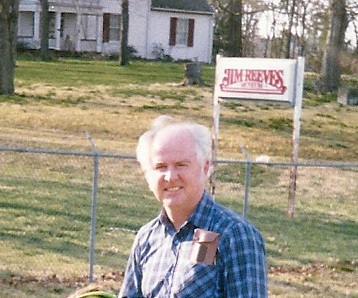 This country gospel song by Jim Reeves meant so much to me when I was young. I remember as a teenager sitting under a thorn tree in Botswana trying to play the mouth organ. This was the first song I managed to play. God will lead us and guide us in His way. This song was written by George Beverly Shea, who used to sing at the Billy Graham meetings. Beloved, I wish above all things, that thou mayest prosper and be in health, even as thy soul prospereth. That is one of my favorite Bible verses. 3 John 1, 2. I met a preacher once, who claimed that Jim Reeves was anti-church because of the song: “My Cathedral.” Later on, thinking about it, Jesus prayed in the Garden of Gethsemane. Did that make Jesus anti-church? Some people have weird ideas. We used to sing this one a lot when we were kids. When I hear this song, my mind goes back to when I was a kid, and the house we were living in, and my parents bedroom. To me, songs paint pictures in my mind. Lynette Dell told me once that he is just expressing other people’s feelings in song. I think he does it well with these country gospel songs. I love the sunsets. God used to talk to Adam and Eve in the cool of the evening. Although this is not officially a religious song, it has a tremendous meaning to me. I heard this song for the first time today, and I cried and cried and cried. He says: “The road to happiness isn’t paved with hate.” Recently the Holy Spirit has been working on me, showing to me that we cannot have bitterness and joy at the same time. We must have one or the other. They cannot both live in us at the same time. Friend, forgive all who have done you wrong. That is the way to happiness. Only then can God forgive us. When I was young, I heard this country gospel song, and it has always been such a comfort to me. At one stage in my life, I lost hope, then this song became so very real to me.